ABSTRACT: There is a similarity between the "strange attractors" of chaos theory and Jung's notion of psychological complexes which may be more than metaphorical. The complex is a meaningful feeling-toned group of representations in the unconscious. It is a sort of manifold of symbolism all relating to the same archetype -- variations on a theme, enfolded in the infrastructure of our subconscious mind. Attractors exhibit their self-iterating capacity in the psyche by demonstrating their attractive or seductive power as phenomena, ideas, theories, moods, and behaviors. The scientific metaphor provided by chaos theory allows us to describe the psyche in terms congruent with physical reality as presently understood in CDS (complex dynamical systems). According to classical Greek myth, only Chaos existed in the beginning. The random element eventually produced Gaea, the deep-breasted earth, or matter. For matter to exist, the force of attraction also had to appear (super-celestial Eros). Uranus, the starry heavens, the evolutionary impulse, is Gaea's first-born child. In other words, the first descent of matter into the threshold of concrete existence came from a chaotic matrix. Chaos, the gaping maw of open space, is a pure cosmic principle. This cosmic trinity of chaos, matter and attraction lies at the heart of chaos theory, the field of complex dynamical systems (CDS). Just as the ancient pantheon helped to orient the Greeks as a foundational perspective, CDS provides tools for constructing cognitive maps that really work in a practical way to give us an edge, or advantage, in our own evolution. It gives us phenomena, models, and metaphors such as deterministic chaos, "strange attractors," turbulence, stretching time and folding space, and nonlinear phenomena. 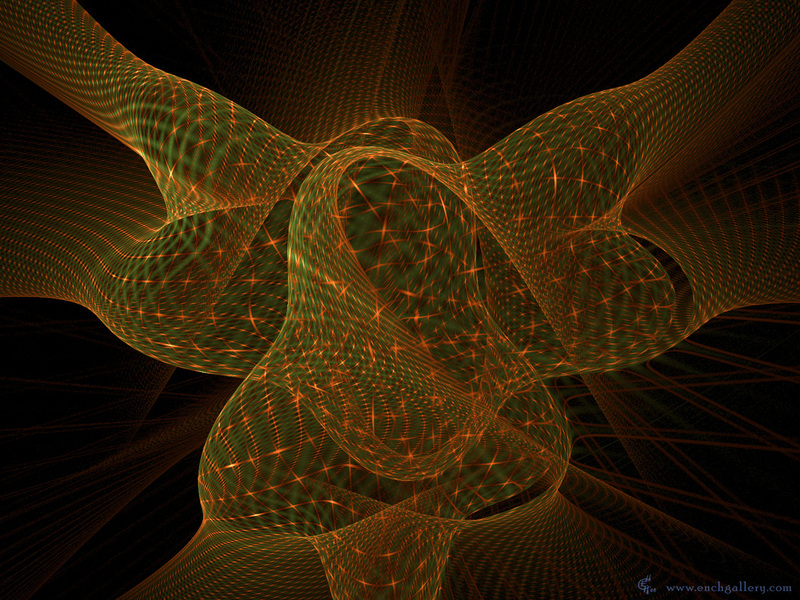 Several Jungian psychologists, most notably Ernest Rossi, have observed that the new science of chaos theory, with its strange attractors, is suggestive of some of Jung's most basic assertions about the psyche. In fact, they have noticed that the concept of "strange attractors" is archetypal in its appeal. In the sciences in general this concept of chaotic attractors has taken on the quality of an activated archetype in collective awareness. The attractor once again exhibits its self-iterating capacity by demonstrating its attractive or seductive power as a phenomenon, idea, and theory. Chaotic systems display certain characteristics including complex feedback loops, self organization, holistic behavior, inherent unpredictability. Many of these qualitative descriptors apply directly to Jung's concept of the psyche. It is easy to begin drawing analogies with his concept of the self, complexes, archetypes and their seemingly chaos-infusing effects on the ego and its concepts of control and orderliness. Jung came upon his theories of the psyche through first-hand empirical observation of his clients. He shared an interest in their hopes, dreams, problems, belief systems, and myths which gave their lives meaning. Jung trusted his perception of psychological phenomena when outlining the characteristics of the complex dynamical system we call psyche. The complexity of the psyche reflects not only on the issue of mental health and well being. Even more fundamentally it relates directly to issues of survival and evolution. A complex system is more creative and flexible at solving all the problems life has to offer. Heinz Pagel in THE DREAMS OF REASON, (Simon & Schuster, 1988) has suggested that science has neglected the basic relationship between chaos, order, and evolution: Complex systems exhibit far more spontaneous order than we have supposed, or order evolutionary theory has ignored. But that realization only begins to state our problem...Now the task becomes much more trying, for we must not only envision the self-ordering properties of complex systems, but also try to understand how such self-ordering interacts with, enables, guides, and constrains natural selection. Its worth noting that this problem has never been addressed. Psychologist Abraham Maslow described the human developmental process as a series of periodic risers beginning with basic survival issues and culminating in self-actualization. The ability to execute one's free will increases exponentially. This is because energy or libido formerly wrapped up in "stuck" patterns becomes available to the ego to use as it chooses. Despite the fact that Jung had a profound yearning to see a kind of "unified field theory" between physics and psychology, he continued to support his own observations, rather than restrictively tie them to the limited scientific metaphors of his day. Physical science had not yet caught up with Jung's concepts. His concept of depth psychology based on archetypes (read "attractors") escaped the Procrustean bed of a limited physical worldview. "Jung's descriptions of psychological phenomena are very similar to system descriptions coming from the new science of chaos...Jung described regular recurrent qualitative forms (archetypes) contained in the specifics of human interaction; he emphasized the polar interactional nature of human phenomena (anima/animus, shadow/light); and he noted the potential for patterns of events related in a way beyond the immediate cause/effect relationship (synchronicity). "Chaos" is a mathematical/ physical science of dynamical interactions that reveals regular qualitative forms and describes relatedness beyond immediate cause/effect. One of Jung's great contributions was his insistence on the validity of such phenomena in the face of the restricted scientific metaphor of his time. Chaos and dynamical systems now provide "hard" science terms that fit and support Jung's observations." A state-of-the-art empirical foundation is essential for any well-grounded philosophy of life and realistic self-concept. It helps us evolve out of the body/mind or nature/spirit split instilled during the era of mechanistic science. Great minds, like Jung, have been moving in this direction waiting for science to catch up. Consciousness may be an all-pervasive field, but awareness can be imagined more like a flashlight that can be selectively focused on different areas. One can broaden the beam and expand awareness of self to include more and more consciousness through such experiences as psychotherapy, meditation, and a mental grasp of the physical nature of reality. Newtonian mechanics is great for describing the movement of planets and star systems. Quantum mechanics, with its inherent uncertainty, non-locality, and fuzziness, describes the mysteries of the sub-atomic realm. Humans participate in both, to be sure, but rather than only macro- and micro-systems, we also need one that fits the human scale. This model needs to be compatible with human capabilities and experience. Humans, though partaking of the macroscopic and microscopic worlds normally focus awareness in a median range. In this median (mesocosmic) range, it seems chaos reigns supreme. We see chaos in the various forms of turbulent movement and natural growth in nature. We see it in the flight of birds, the seeds of a sunflower, the rapids of a river, the patterns of weather, and much more. And, we see it in our destinies. We even try to find some meaningful ordering principle within that chaos to call divine. This model of purposeful, though intuitive chaos is perhaps one underlying aspect of the concept of karma. It may not be apparent to an individual why certain types of experiences come, but there seems to be an underlying order and purpose, even though it may remain unconscious. The choices implied by the free will inherent in chaotic systems seems to switch some responsibility onto the evolving ego and away from chance fate. An act of free will represents rational insight trained upon past experience, self interest, and potential reward. Chaos theory gives us a visual mathematical language for charting strange attractors in dynamical systems. They can be applied within an individual psyche or to interactive relationships. This technology has already been applied to human behavior. 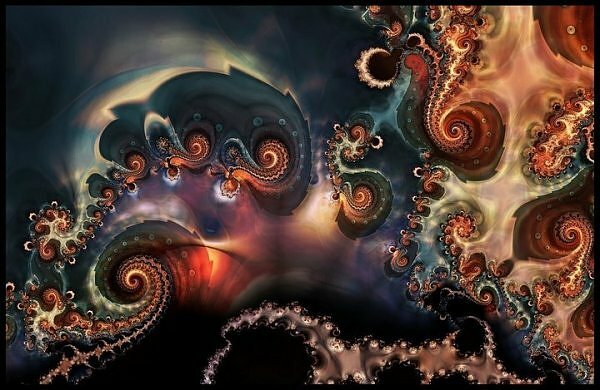 Order and chaos in the emotional realms have been studied by mathematicians and psychiatrists. Their studies [see PSYCHOLOGY TODAY, May 1989, pg. 21] produced models of a person's chaotic and unstable behavior in comparison to their stable behavior. Stable behavior can be imagined as being like the sky, unstable like mountains, with little pockets or "caves" of serenity within them. According to Jerome Sashin of Harvard Medical School, "if we can get people's mental state to fall into one of those caves, their behavior would stabilize." Perhaps dreamhealing, through the chaos, is the quickest route there. It often goes directly into a symbolic "cave." Even mental illness may relate to the phenomena of strange attractors in the brain or emotional field. Some researchers believe, for example, that a number of mental disorders, such as manic-depressive illness and schizophrenia, occur when biological regulatory systems cease to operate at their normal, fixed point and change suddenly to another stable but abnormal point. In chaos theory, when an attractor disappears due to sudden catastrophic change, the system becomes structureless and experiences a term of "transient chaos" before another attractor is found. We can experience identity crisis during major life passages. Perhaps it is not by chance that Jung's theory of the complexes shares a semantic and essential relationship with complex system dynamics. Both complex and archetypes function like strange attractors, drawing numerous associations around themselves. These psychic nexus points are instrumental in the foundation of belief systems, emotional response, and behavior. Each archetype has its parameters, but within the myth there are a jumbled myriad of possibilities that play through the personality seemingly at random, at least to the casual observer. Yet each has its agenda and characteristic mode of appearance. The activation of a mytheme in a life is decoded by noticing its corresponding effects, in dreams and waking life. An individual's personal myth or mytheme might be conceived of as an activated chaotic attractor. In another phase of life, the focus could change to others. Sometimes these transitions are fairly smooth, sometimes competitive, other times catastrophic, sweeping the old structure away in an uncontrollable fashion. The ego can suffer greatly from this jerking around by the deep forces within, especially if it doesn't have enough information about its purpose to derive meaning from the experience. For some, the disruption may lead to a psychotic break, while for others it opens the door to new freedom and an expanded sense of self, and creativity. There are many questions which arise within the model of human development based on chaos theory. We can conjecture about why certain attractors or complexes form. We really don't know why some may become prominent and others fade into the background. But we do know that when two or more are competing for divergent behavior and attitudes, the resulting psychic split can be painful, setting up a deep conflict which may not be easy to resolve. Free choice may be a factor, but our choices are limited by our attitudes concerning what we believe is possible for us. The only solution is to dive to the deepest levels, seeking revolutionary transformation...a quantum leap in consciousness. The first step in understanding how these attractors affect us has to do with our personal complexes, our distorted experiences of raw archetypal power. There are certain obvious parallels between strange attractors and the psychological phenomena of complexes. The complex is a feeling-toned group of representations in the unconscious. It is sort-of a manifold of symbolism all relating to the same archetype -- variations on a theme, enfolded in the infrastructure of our subconscious mind. Complexes may be "hardwired" into our psychic system. We never exist without them and their varying degrees of influence. Complexes consist not only of meaning but also of value, and this depends on the intensity of the accompanying feeling tones, according to Jung. All of them may show somatic as well as psychic symptoms, and combinations of the two. An unconscious complex acts like a second ego in conflict with the conscious ego, an alter ego. This conflict places the individual between two truths, two conflicting streams of will, threatening to tear them in two. 4. confrontation But only confrontation, or conscious empathic identification, can help the ego come to grips with the complex and lead to its resolution. Switching back and forth between ego and complex diffuses polarization. For Jung, the complexes were "focal or nodal points of psychic life, which must not be absent, because if they were, psychic activity would come to a standstill." They constitute those "neuralgic points" in the psychic structure, to which undigested, inacceptable elements, elements of conflict, will cling. Carrying our complexes is usually painful, embarrassing, and a burden. But just because they are painful does not prove that they are pathological disturbances. We always pathologize, but to what extent, and how do we act on that? All human beings have complexes. They constitute the structure of the unconscious part of the psyche and are its normal manifestations. From the behavioral perspective, personality traits are strange attractors. Jung asserts that, "Complexes obviously represent a kind of inferiority in the broadest sense--a statement I must at once qualify by saying that to have complexes does not necessarily indicate inferiority. It only means that something incompatible, unassimilated, and conflicting exists--perhaps as an obstacle, but also as a stimulus to greater effort, and so perhaps, as an opening to new possibilities of achievement." Jung also held that certain complexes stem entirely from an actual situation, above all those which appear in the spiritual crises of middle life. Some complexes have never been in consciousness before. They grow out of the unconscious and invade the conscious mind with their weird and unassailable convictions and impulses. They interfere with the ego complex and functionality. Jung also believed that certain complexes arise on account of painful or distressing experiences in a person's life. When we experience trauma, we may "get a complex" about something. These unconscious complexes are of a personal nature. They are one source of [post traumatic] subliminal stress. But there are also others, autonomous subpersonalities, that come from a source having nothing to do with our daily life. They have to do with the deepest irrational contents of the psyche--that which has never been conscious before. Jung termed them shadow, anima/animus, and self. Unlike the contents of the personal unconscious which seem to "belong" to us, the contents of the collective unconscious seem alien (Not-I), as if they had invaded from outside. The reintegration of a personal complex has the effect of release and often of healing (mental and physical). But the invasion of a complex from the deep collective psyche is a disturbing, even threatening, phenomenon. The parallel with the primitive belief in souls and spirits is obvious. This is where those energies and images come from. Souls correspond to the autonomous complexes of the personal unconscious. Spirits are those of the collective unconscious. In psychotherapy, only a certain number of complexes, varying with the individual, can be made conscious. No one can ever fathom the entire contents of the psyche or self. To attempt to do so would be superheroic, an ego error. It is grandiose to consider. The remaining complexes continue to exist as "nodal points" as "nuclear elements," which belong to the eternal matrix of every human psyche. They remain potential and do not unfold into the objective world. Although psychic energy operates continuously, it is "quantum-like" in nature. The quanta in our comparison are the complexes, innumerable little nodal points in an invisible network. According to Jung and Jacobi, In them, as distinguished from the "empty" spaces, the energy charge of the unconscious collective psyche is concentrated, acting in a manner of speaking, AS THE CENTER OF A MAGNETIC FIELD. If the charge of one (or more) of these "nodal points" becomes so powerful that it "magnetically" (acting as a "nuclear cell") ATTRACTS EVERYTHING TO ITSELF and so confronts the ego with an alien entity, a "splinter psyche" that has become autonomous--then we have a complex. [Emphasis added by editor]. If that entity expresses through mythical or universal transpersonal imagery, it has originated in the collective unconscious. If it is contaminated with individual, personalistic material, if it appears as a personalized conflict, then it has emerged from the personal unconscious. In summary complexes have: 1). two kinds of roots - infantile trauma or actual events and conflicts. 2). two kinds of nature - pathological or healthy. 3). two kinds of expression - bipolar, positive and negative. Complexes, as strange attractors of undefined psychic energy, actually are the generic forms and dynamic structure of the psyche. The complexes themselves are essential, healthy components of the psyche, unless they have been twisted by fate. What comes from the collective unconscious may be intense, but it is never "pathological." All our sickness comes from disturbances in the personal unconscious. This is where pure complexes are colored by our individual conflicts. When the complex is cleared of the emotional baggage of the personalistic expression, its true, pure, archetypal center shines through. The personal was superimposed over the transpersonal, but that can be changed with therapy, by raising it into conscious awareness. Then the nucleus or archetypal core shows through. When the conflict seems unresolvable for consciousness, when its desires are continually thwarted, we often find that it is the contents of the collective psyche that are intractable. If a complex remains only a greater or lesser strange attractor in the deep psyche, if it doesn't swell up with too much personal baggage, then it usually stays positive. It functions as the energy-giving cell from which all psychic life flows. But if it is overcharged it can turn negative, in the form of neurosis or psychosis. Erich Neumann commented in THE ORIGINS AND HISTORY OF CONSCIOUSNESS: We can see in pathological cases, in fixed or compulsive ideas, manias, and states of possession, and again in every creative process where "the work" absorbs and drains dry all extraneous contents, how an unconscious content attracts all others to itself, consumes them, subordinates and co-ordinates them, and forms with them a system of relationships dominated by itself. When the conscious mind cannot cope with these contents, the result is fragmentation, disorganization, disintegration -- chaos. The role of the complex is determined by its interaction with the conscious mind, what states it creates. Without understanding, it de-stablizes the personality. But in so doing, it opens the possibility of re-stabilizing at another level. It takes understanding, assimilation, and integration of the complex to appease its destructive energy. Otherwise the conscious mind falls victim to a regression and is engulfed by the deep psyche. PSYCHOLOGICAL PERSPECTIVES, Vol. 20, Number 1, Spring-Summer 1989. COMPLEX, ARCHETYPE, AND SYMBOL, Jolande Jacobi, Princeton University Press, 1959. THE ORIGINS & HISTORY OF CONSCIOUSNESS, Erich Neuman, Princeton University Press, 1954.